Business Green Rewards Card from American Express Review: Is It Worth Getting? An all right business card for earning rewards for eligible American Express Travel bookings. While the Business Green Rewards Card from American Express requires businesses to have excellent credit to be approved, it only offers an OK rewards rate on eligible travel booked through American Express Travel. If you have good enough credit to be approved for the Business Green Rewards Card from American Express, you most likely have access to some of our favorite business cards. How Does the Business Green Rewards Card from American Express Compare to Other Cards? In terms of earning rewards, the Business Green Rewards Card from American Express's 2% rate on eligible travel bookings made through the American Express Travel website is pretty good. However, it's not nearly as flexible as the travel rewards offered by some other business cards. By contrast, the Ink Business Preferred℠ Credit Card will give businesses a 3.75% rewards rate on all travel purchases (for the first $150,000 of combined spending in select categories). This includes travel purchases that can't be booked through Amex Travel—and therefore wouldn't earn 2% with the Business Green Rewards Card from American Express—such as taxi rides and Airbnb nights. One area in which this card really falls short is its lack of a significant introductory welcome bonus. The 5,000 points—worth an estimated $50—that businesses earn after making their first purchase with the Business Green Rewards Card from American Express is far lower than what comparable cards are offering as a welcome bonus. While this is only a short-term benefit, a sizable welcome bonus can go a long way in terms of justifying a card's annual fee. For example, the Capital One® Spark® Cash for Business's $500 bonus—for making $4,500 in purchases within the first three months of account opening—is enough to cover its $95 ongoing annual fee for five years. 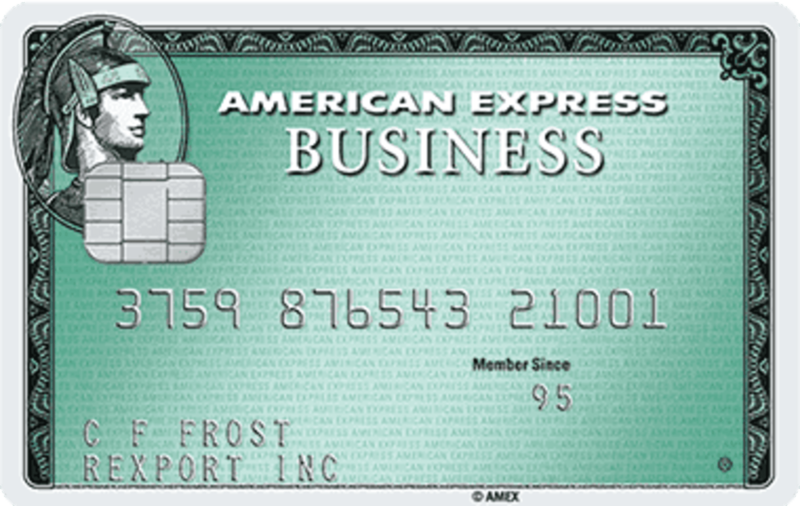 The Business Green Rewards Card from American Express is a charge card as opposed to a credit card. This means you must pay your balance in full each billing cycle, making the card a poor option for businesses that are looking to finance purchases. The advantage of charge cards is that they have no preset spending limit, which gives businesses more freedom to make big purchases with their cards. Bottom Line: If you are interested in an AmEx business card, you should go with American Express® Business Gold Card. Businesses with the Business Green Rewards Card from American Express will earn 2 Membership Rewards points per dollar spent on eligible travel bookings made through the American Express Travel website and 1 point per dollar spent on all other purchases. Cardholders are not limited in the amount of rewards they can earn. We estimate the value of each point to be 1 cent, which puts the Business Green Rewards Card from American Express's rewards rate between 1% and 2%. The Business Green Rewards Card from American Express also rewards cardholders with 5,000 points after making the first purchase with their card. At a $50 value, this is much lower than other business card bonuses, which can be worth around $1,000 in the case of the Ink Business Preferred℠ Credit Card. However, there is no introductory spending requirement to get this bonus—which is often the case with welcome bonuses. Membership Rewards points can be used for travel purchases through American Express Travel. They can also be redeemed as gift cards and shopping as well as transferred to a number of airline and hotel frequent travel partners, including Delta, British Airways and Hilton. There is a transfer fee of 0.06 cents per point, which is capped at $99 per transfer. However, transferring points can still be an excellent value, as transferred points can be worth as much as 1.2 cents each—a 14% increase in value after accounting for the fee. The Business Green Rewards Card from American Express does not have an annual percentage rate (APR) because it is a charge card, and therefore it requires cardholders to pay their bills in full every month. This is different from credit cards, which charge interest on purchases that are not paid in full at the end of the billing cycle. Failing to pay your balance in full with the Business Green Rewards Card from American Express could result in hefty fees or your account being closed. Charge cards, like the Business Green Rewards Card from American Express, have no preset spending limit. This means the amount you can spend during a given billing cycle will depend on your credit history. Generally, this means charge card holders have more flexibility when it comes to the amount they can charge to their cards. This can be beneficial to businesses that need to make large purchases from time to time that won't fit in a traditional credit limit. For rates and fees of the Business Green Rewards Card from American Express, please click here. When you're shopping around for credit cards, it is important to consider how a card compares to other available offers. This gives you a better frame of reference for the value of a card. Below, we have compared the Business Green Rewards Card from American Express to some of our favorite business credit cards available. The Ink Business Preferred℠ Credit Card is one of our favorite credit cards for businesses, and it is superior to the Business Green Rewards Card from American Express in almost every way. It features a fantastic 3.75% rewards rate for travel, advertising, internet and phone services, and shipping for the first $150,000 in combined purchases, plus 1.25% on all other spending. For travel purchases, this means you will be earning almost 90% more rewards than you would with the Business Green Rewards Card from American Express. The Ink Business Preferred℠ Credit Card also features an 80,000-point bonus after users charge $5,000 in purchases within the first three months of account opening. We estimate this to be worth $1,000, which is $950 more than the Business Green Rewards Card from American Express's $50 welcome bonus. Because of the increased rewards earning potential, we recommend the Ink Business Preferred℠ Credit Card over the Business Green Rewards Card from American Express. Earn 3 points per dollar spent on select purchases and 1 point per dollar spent on everything else. Get a welcome bonus of 80,000 points after spending $5,000 on purchases in the first three months after account opening. The Capital One® Spark® Cash for Business offers a solid rewards rate—at 2%. However, the biggest difference between the two cards is that the Business Green Rewards Card from American Express gives businesses cash-back rewards that can be used for any purchase. By contrast, the Membership Rewards points that the Business Green Rewards Card from American Express earns are worth far less when used for cash back than when transferred or redeemed for travel through American Express Travel. Businesses that don't want to have to work to figure out the best redemption options should go with the Capital One® Spark® Cash for Business. Get unlimited 2% cash back on all purchases. Earn a $500 cash bonus once you spend $4,500 on purchases within three months of account opening.